Over the last 60 years, Thai hospitality has grown from a fledgling industry to one admired and respected around the world, and it was Thanpuying Chanut Piyaoui’s vision, determination and commitment that has built Thailand’s most respected hotel name, Dusit International. At young age, Thanpuying Chanut’s family had sent her to the USA in hopes of broadening her horizons. The fruits of their effort far exceeded their expectations. There lies the beginning of her celebrated vision “why shouldn’t I be the one to build it?” An inspiration that generated a chain of great hotels that values efficiency, delivers graciousness and most certainly the warmth of Thai hospitality across the world. When Thanpuying Chanut Piyaoui, a pioneering lady of Thai hospitality, returned from the USA in 1947, she aspired to build a hotel that would be like the ones she had admired in the USA, but would have to be specifically Thai. That was only the beginning of her lifelong endeavour in offering the charm of Thai hospitality to the world. 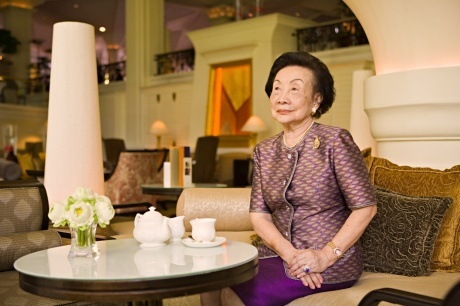 Her life’s work began with the building of Bangkok’s first modern hotel with a swimming pool, the original Princess on New Road opened in 1949 by HRH Princess Galayani. In time, she progressed to five-star properties in Bangkok and major tourist destinations in Thailand and overseas. Further expanding into hotel education with Dusit Thani College in 1993, followed by culinary education in a joint venture with Le Cordon Bleu opening in 2007. She did not, however, rest with these accomplishments. Introducing Deverana Spa, the Chanut opened up a wealth of traditional Thai therapies set in Thai-inspired luxury for the world to experience.